Hello! Hope you're all having a lovely weekend? When I took the pics for this post a few days ago on a lovely sunny spring afternoon, little did I know I would be publishing this post on a awful snowy afternoon!! So, anyway, Myself and 4 other bloggers were contacted to see if we'd like to review a dress, but not any old dress, this dress is one of the new Project D London for Simply Be dresses! I was really excited at this prospect, there's been a lot of buzz around this range and I was interested to test the dress out for myself. We were sent the Lincoln print maxi, I'm not sure this would have been my first choice from the range. It's very beautiful, but maybe a little mature, or formal for my wardrobe? There is no denying the quality of this dress, fully lined in a beautiful lilac silky fabric, the dress wouldn't be out of place at a wedding or the races for example. I think I'd like to try and dress it down to suit my wardrobe a bit more, maybe with a belt, sandals and trusty denim jacket? But for the purposes of this post I styled the dress simply with turquoise jewellery to pick out the lovely flashes of blue in the dress and some beige wedges. 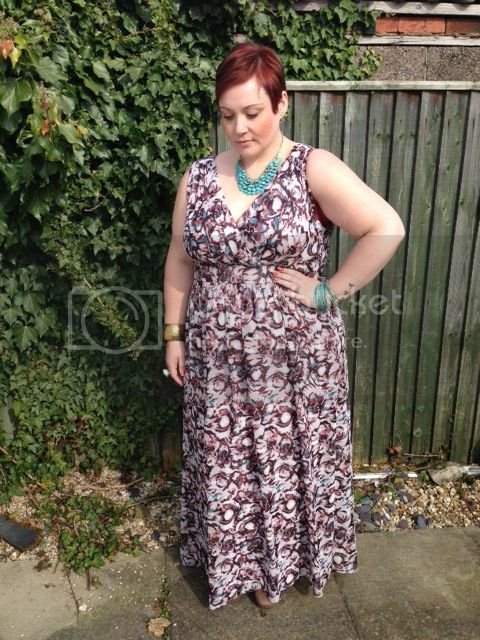 The dress itself is quite roomy in the bust area so is ideal for all you ladies blessed with the bazoomas! I went with my usual 22 and found it true to size. The lining was snug against my skin though so if you're a very hippy 22, it might not work for you. The back of the dress has an elasticated section for a nice fit and has a lovely cut out detail that's really pretty. This really is a very gorgeous dress and if you have a big occasion coming up, a sunny holiday or even some summer nights out planned this would be a great addition to your wardrobe. It's a lovely dress but its not really any thing special. Like you said it does seem to be aimed at a more mature audience which kind of defeats the object of bringing on board a 'hip' designer. I also don't see the point of a summer dress being lined esp if the dress is thick. I think it would be cute with a chambray shirt tied at the waist. That would definitely keep it casual and young. Plus, I've heard it said that if you're young and hip, your clothes will reflect that and you won't look matronly. So, I think you're in the clear. I actually really love this dress on you! And I am a sucker for all things turquoise, so you had me at necklace, lol! I thought I'd left a comment on here, but I mustn't have finished it off! I really love the necklace in this post, was it a recent purchase? It's a really cute, summery dress but I wonder if it would be a bit more versatile if it was shorter?